Anyone who has strolled through the World Financial Plaza might have noticed a few things recently. A big ol’ country house built smack in the middle of the esplanade, a glass encased metal contraption that has something to do with the weather, and not just one — but two new food stands on the upper level of the plaza. The trend seemed to have started last year, when Merchants opened up a satellite BBQ stand on the plaza. The food was ambitious — filling in a gap for smokey bbq that doesn’t quite exist on this side of the highway. BBQ is not the easiest thing to cook up or serve to transient tourists and button down banker crowds. This year, they decided to forgo their spitfire aspirations and flip things up with a “quality burger.” Merchants has seemed to monopolize the majority of eateries this side of Broadway owning Merchants, Southwest, the newly acquired Steamers Landing and now Quality Burger. 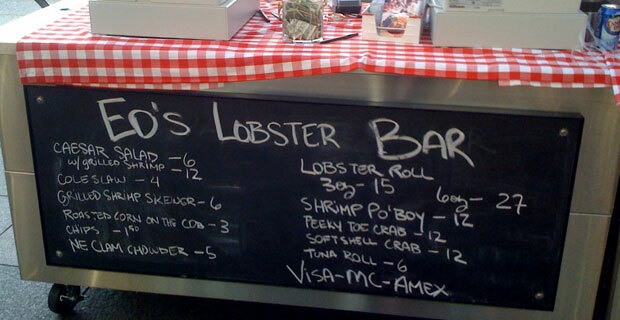 So I was quite surprised to see standing right next to the expected Merchants fare — Ed’s Lobster Bar. One might plausibly expect that it’s just another Merchants restaurant, but this is not the case. Bringing their claws out on the plaza, Ed’s Lobster Bar serves up an easy to eat, summery and refreshing lobster roll. Some other sandwich offerings are a Grilled Shrimp Po’ Boy, Peekytoe Crab Roll, Tuna Roll and a Soft Shell Sandwich. The average price for a meal is around $20. Which is not cheap, but unlike the impersonal burger conveyor belt service served at Quality Burger — customer service at the Lobster Bar is exceptional. Case and point, after arriving just before closing at 7pm– they stayed open long enough to receive a few late coming customers. After running out of grilled corn on the cob, they were able to procure a few stalks and offered them up to a patron for free. They were communicative towards the time it would take to grill shrimp skewers and lobster roll — all with a friendly smile and that it was no problem to stay open later than they needed to. Making the meal taste that much better. So with open hearts and stomachs, we whole heartedly welcome Ed’s Lobster Bar to the neighborhood.